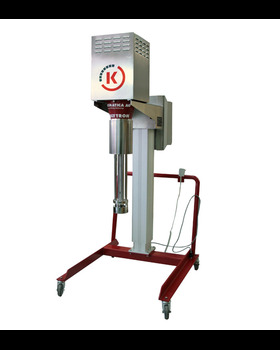 POLYTRON® machines are batch high shear, rotor/stator homogenizers to create dispersions and emulsions with very fine particle or droplet sizes. A large variety of different rotor / stator geometries enable us to customize the unit to your application. Our units have proven time and time again to cut processing times down from hours to minutes and more importantly have improved the overall quality of the final product. All Kinematica POLYTRON® Pilot Plant and Production machines are built to withstand sustained running times required for production processes. They are easy to operate and easy to maintain. All of the above can be mounted on a tank lid with a flange or on a stand or wall. Each of these lines, offer a broad choice of different drive systems, shaft lengths, dispersing generators, stands and drive controls. All POLYTRON® PT series motors can be offered in explosion proof versions according to ATEX or NEMA regulations. – Simple, robust design for easy use and long life. – POLYTRON® can be mounted on stationary or moveable stands. In addition, the stands can be offered as manual lift or with the heavier motors, we recommend an electric lift. Kinematica’s application experts and process engineers are ready to recommend the proper unit to solve your application needs.